People are voting in a general election in Japan, where former leader Shinzo Abe is challenging the current prime minister, Yoshihiko Noda. Shinzo Abe’s Liberal Democratic Party (LDP) is expected to oust Yoshihiko Noda’s Democratic Party (DPJ) after just three years in office. Shinzo Abe promises more public spending and a more assertive foreign policy as tensions with China run high. 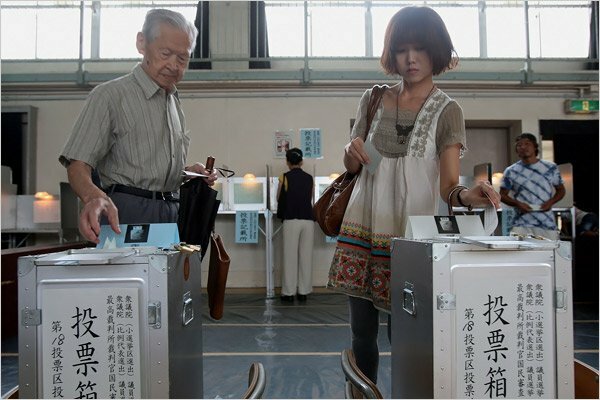 Many voters remain undecided, amid disillusionment in Japan over politics. Shinzo Abe’s centre-right LDP was swept from office by the DPJ in 2009, ending more than 50 years of almost unbroken rule. The DPJ promised more welfare spending and a better social safety net, but struggled to deliver amid the economic downturn and 11 March 2011 earthquake and tsunami. It has also seen several leadership changes – Yoshihiko Noda is the third DPJ prime minister since 2009. Shinzo Abe, 58, served as prime minister from 2006-2007 before stepping aside amid plummeting poll numbers, citing illness. He says he will now use public spending in an effort to end 20 years of economic stagnation, and that nuclear energy has a role to play in resource-poor Japan’s future despite last year’s nuclear disaster at Fukushima. Shinzo Abe has also called for a tough stance on the territorial row with China over East China Sea islands that both countries claim. Now Japan looks like it is about to take a dramatic turn to the right. Relations between Japan and China, which are already poor, could be about to get worse, he says. Yoshihiko Noda lost public support over the move to double sales tax, something he said was necessary to tackle Japan’s massive debt. The debate over nuclear energy, restarting suspended reactors and his perceived flip-flopping on the issue have also affected his popularity. Latest figures indicate that the LDP will win a clear majority, together with its traditional ally, the New Komeito Party. All 480 lower house seats are up for grabs in the election. Polls opened at 07:00 and are due to close at 20:00.